Our Newest Multiport Electronic Fuel Injection - Now More Power! 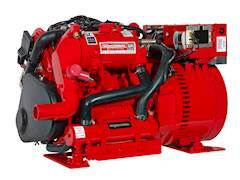 The 7.5 MCGA exemplifies one of the most compact low-CO, low-speed gasoline generators on the market. Westerbeke's unique marine design allows for a high performance generator that is comparable in size to high speed competitors. The lower operating speed of the 7.5 MCGA combined with a heavy duty industrial base engine contribute to a longer lasting more reliable product. The 7.5 MCGA features sequential multiport electronic fuel injection (MPI). MPI provides optimum fuel efficiency, easy starting, improved reliability and reduced emissions. In conjunction with MPI, electronic speed control maintains the engine at a constant speed (precise frequency regulation) and virtually eliminates "bogging down" when load is applied. A water cooled returnless fuel system aids in the prevention of vapor lock for improved performance in high ambient temperatures. MPI also features advanced diagnostic capabilities. Featuring a 3-cylinder industrial engine operating at an electronically controlled 1800 rpm, the 7.5 MCGA is extremely smooth and quiet running. In comparison, 3600 rpm engines are generally noisier than their 1800 rpm counterparts and require sound shields to attain similar sound levels. The 7.5 MCGA is backed by Westerbeke's 5-year limited warranty. The presence of Westerbeke in over 65 countries around the world provides customers with easy access to parts, service and technical support. Established in 1937, Westerbeke is committed to providing its customers with quality products and unequaled after sales support.